Chris Harbourt, Adjunct Assistant Professor on lessons from his entrepreneurial journey, upcoming industry trends that budding entrepreneurs could leverage, hurdles that entrepreneurs should always be ready for, and more. Chris Harbourt is an engineer, venture advisor, and entrepreneur with over 20 years of experience in agriculture, business, and academia. Founding CEO of Agrible (Agrible was acquired by Nutrien in July 2018), Adjunct Assistant Professor at the University of Illinois Urbana-Champaign, he believes that community entrepreneurship support is absolutely crucial for launching a successful startup. 1. In your opinion, what makes a successful entrepreneur? I feel that a successful entrepreneur is someone who is more risk-tolerant than the average person, someone who is excited by opportunities, and is ready for challenges. 2. Do you think anyone can learn entrepreneurship? Are entrepreneurs made or are they born with an entrepreneurial trait? I don’t think anyone is born with a specific “entrepreneurial” trait. However, some people may have an advantage based on the way they were raised. Those who have had parents who are entrepreneurs or business owners have an advantage over those who don’t because they have an appreciation for the challenge. However, that is not the end of the road. Anyone can decide to take on that challenge. 3. What are the biggest entrepreneurship lessons you have learned so far? Biggest challenge or lesson has been doing the right business thing in the right order at the right time. But knowing all along that there is way too much to get done at any given time. Entrepreneurship is about judgement calls. You have to be ready to truly multi-task on fundraising, technology development, team building, and more. 4. What do you consider your greatest success? Balancing family and business. In the past, I may not have been the best at it. But I think managing to have success within your family and business simultaneously is probably the biggest challenge and the greatest success. 5. Can you describe a time when you failed and how have you overcome those failures? What did you learn from those experiences? There was a company we formed when I was fresh out of college, and my co-founder and I moved that company from Urbana-Champaign to Washington D.C. We were in a new town, unfamiliar environment, and didn’t have network of people we knew there. Although we had a great idea and motivated team members, we just didn’t have the network in place to get the startup off the ground. I learned that having a network of people and community entrepreneurship support like what’s here at the Research Park and TEC among others is absolutely crucial for launching a successful startup. 6. 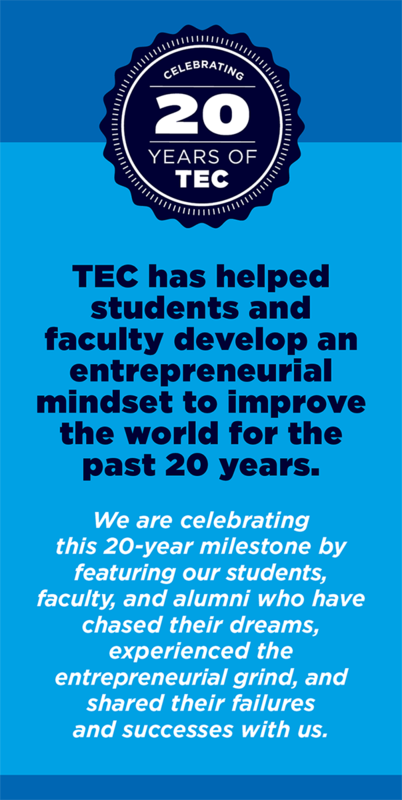 How has the entrepreneurship ecosystem evolved in and around the campus? How should students’ best utilize the widely available resources in and around the campus to succeed as an entrepreneur? When I was a student here at the University of Illinois at Urbana-Champaign back in 90’s, the startup ecosystem was nonexistent. There was no Cozad and other such competitions to prepare you for setting off on an entrepreneurial track. Now, the campus has a deep entrepreneurship ecosystem. It is a very mature path with a lot of experienced people to help you navigate the entrepreneurial path. 7. How did the entrepreneurship ecosystem at Illinois contribute to your success as an entrepreneur? When we launched Agrible, the Research Park was instrumental in connecting us with industry partners that led to corporate contracts, which led to credibility within markets. The Research Park has many conferences, mixer events, social gatherings, and in-house resources that helped me network and succeed as an entrepreneur during my time at Agrible. 8. Do you think college is a good time to launch a startup? What did you enjoy most about your college life? I had a startup in graduate school and it was not a success but it was a great learning experience. I had successes in my 20s, 30s, and 40s, so I would say that there is no time like the present time to start to learn. Anytime could be a good time for you to launch a startup if it’s what you’re passionate about. 9. Besides Agriculture, Agriculture Technology what other industries attract you? I am very interested in medical technologies. You not only get an opportunity to be successful but also help people have a better quality of life. I am also interested in creating products; I think people who build physical products have an advantage because people are always interested in new technologies and products that increase quality of life and convenience so there’s plenty of opportunity there. 10. What are the most important trends in Agriculture Technology that could be an opportunity for entrepreneurs? Precision agriculture is inevitable and we’re seeing a growing wave of startups that merge smart technology and data. Being able to obtain good and relevant data on a field to be able to make smarter and more efficient farming decisions is a huge opportunity within the agriculture technology industry. It’s a gold mine of opportunity for agriculture entrepreneurs if successfully applied. 11. What other upcoming trends do you see as opportunities for entrepreneurs? I think Robotics and Augmented Reality are going to see explosive growth. These two trends could be leveraged by entrepreneurs. 12. What are the biggest challenges/hurdles that an entrepreneur should always be ready for? You might think there is a market for your product when there may be none. Product market fit is critical. You should always be in touch with customers within your target market. You should know that your product is something that the customers really want before venturing on a years-long journey to launch a startup where there really may be no market. 13. What is your one piece of advice you’d give to an aspiring entrepreneur? You will fail at something almost every day and that’s ok, but if you strive to be self-aware and learn from it each time eventually you will find success. 14. What do you like to do outside of work life? Interests? I like kayaking. I also have a collection of old cars and I am in the business of restoring several classic cars. Aviation and photography also interest me. 15. Who are your role models? Karl Benz and Howard Hughes. They both had amazing visions. Karl Benz invented the automobile--enough said there! And Howard Hughes was a master at raising the bar and taking on risk. 16. Recently Agrible was acquired by Nutrien. What was that experience like and how has this affected you personally and professionally? The experience overall was 6 years of very hard work, and nearly more than I could handle. In the end the outcome was good for investors, good for employees, and I hope that it continues to be good for customers. The experience helped me build an in-depth understanding of the agriculture industry and network to be able to navigate it better now. I am helping build companies like AirScout, a precision Agriculture data company leveraging high-resolution aerial imagery to help farmers scout their fields more efficiently. Another one is TellTail, a predictive technology startup for livestock, specifically focusing on gestating sows within the swine industry. It’s exciting to be helping build these new startups and see how they will fit into the larger Agriculture Technology domain, that’s only growing from here.